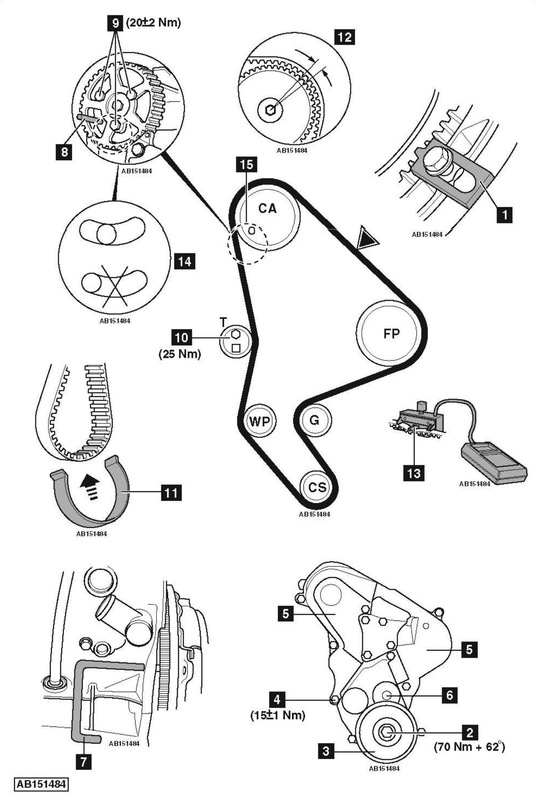 Citroen Jumper 2.2HDi 2003 cambelt change instructions and replacement inteval. Full guide! Flywheel locking tool – Citroen No.(-).188.F. Flywheel timing pin – Citroen No.(-).0188.Y. Camshaft timing pin – Citroen No.(-).0188.M. Tensioning tool – Citroen No.(-).0188.J2. Timing belt retaining clip – Citroen No.(-).0188.K. Tension gauge – SEEM CTG 105.5M. Crankshaft pulley puller – Citroen No.(-).0188.P. NOTE: The high-pressure fuel pump fitted to this engine does not require timing. Lock flywheel  . Use tool No.(-).188.F. Refit crankshaft pulley bolt without thrust washer  . Fit crankshaft pulley puller. Tool No.(-).0188.P. Detach crankshaft pulley from crankshaft. Refit bolt fitted with a 17 mm thick spacer  . Tighten bolt to 15±1 Nm. Insert timing pin in flywheel  . Tool No.(-).0188.Y. Insert timing pin in camshaft sprocket  . Tool No.(-).0188.M. Turn tensioner pulley clockwise away from belt. Use tool No.(-).0188.J2. Tighten bolts finger tight  . Turn camshaft sprocket fully clockwise in slotted holes. Secure belt to crankshaft sprocket with retaining clip  . Use tool No.(-).0188.K. Fit timing belt in anti-clockwise direction. Ensure belt is taut between sprockets. Lay belt on camshaft sprocket teeth. Engage belt teeth by turning sprocket slightly anti-clockwise. NOTE: Angular movement of sprocket must not be more than one tooth space  . Fit timing belt to water pump sprocket and tensioner pulley. Attach tension gauge to belt at  . Tool No.SEEM CTG 105.5M. Turn tensioner pulley anti-clockwise until tension gauge indicates 98±2 SEEM units. Tighten tensioner pulley bolt  . Tightening torque: 25 Nm. Ensure sprocket bolts not at end of slotted holes  . If necessary: Repeat installation procedure. Tighten camshaft sprocket bolts  . Tightening torque: 20 Nm. Turn crankshaft eight turns clockwise to setting position. Slacken tensioner pulley bolt to release tension on belt  . Turn tensioner pulley anti-clockwise until tension gauge indicates 54±2 SEEM units. Tighten camshaft sprocket bolts  . Tightening torque: 20±2 Nm. Check belt tension: Attach tension gauge to belt at  . Tension gauge should indicate 54±3 SEEM units. Turn crankshaft two turns clockwise to setting position. Ensure timing pin can be inserted easily  . If locking tool cannot be inserted: Visually check camshaft sprocket hole  aligned with hole in cylinder head. If holes are misaligned, this should be less than 1 mm. If misalignment of holes more than 1 mm, repeat installation procedure. Remove bolt and 17 mm spacer  . Bolt  . Tighten bolt to 15±1 Nm. Coat crankshaft pulley bolt with suitable thread locking compound. Tighten crankshaft pulley bolt  . Tightening torque: 70 Nm + 62°.